You don’t often find ruins and boarded up buildings in downtown Toronto, but until a year and a half ago, you could see one of the city’s oldest buildings at Adelaide and Simcoe St, boarded up and slowly decaying. The group of townhouses known as Bishop’s Block were built around 1829 or 1830, making them some of the oldest extant buildings in Toronto. Their unassuming nature and relative ugliness made them easy to miss—I drove by them hundreds of times before realizing just how old they were. They last saw occupants in the 1970s, but before that were once fashionable middle-class homes in Victorian Toronto and may have even been part of Toronto’s first hotel. It was that fairly recent discovery that probably saved them—although how much will be saved is up for some debate. They were dismantled, brick by brick, to be resurrected as part of the new Shangri-La hotel now going up on the site. Some fascinating and revealing archaeological excavations also took place on the site. The buildings themselves were heavily decayed, and given the articles I’ve read on the project, about the only thing likely to be preserved are facades. (This has been justified on the grounds that the interiors were nothing like what was originally built in the 19th century). The contractor responsible for that part of the project recently completed a more ambitious facading project—the National Building—just up the street from where I work. However, the main architects (ERA) for the Bishop’s Block project are also responsible for the work on two former abandoned sites, the Distillery district and the Carlu, so their historic preservation creds are pretty solid. I’ll be curious to see what emerges. The National Building was completed in 1926 in the classic Chicago style of early skyscrapers. 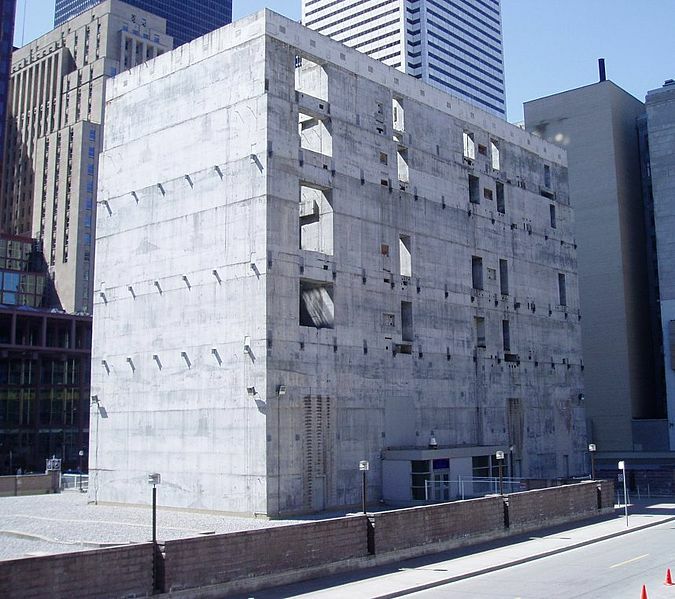 It never became a complete ruin and had occupants almost right up to the point that it was dismantled, but had apparently been sloppily repaired over the years and, again, was “unsalvageable.” However, the façade had a certain elegance to it and was in keeping with nearby Bay St. architecture, so the decision was made by the architects to save the west and north facades and incorporate them into the building. The facades were carefully dismantled, repaired, and then reerected as part of the new Bay Adelaide Centre. I’ve taken a couple of photos of the results (although I’ll have to post tomorrow as I accidentally deleted them off my new camera). Historical preservation was not really the focus of this particular project, and the whole idea of “facading” as a way to preserve history has not gotten a lot of good press. I do not believe any effort was made to preserve any of the interiors in this particular case. Right now, none of the ground-floor offices are occupied, and the whole structure looks curiously shiny and new. It should also be noted that just to the south of the National Building was another building of about the same height apparently so forgettable that it doesn’t even appear on Emporis.com. It was torn down floor by floor by welders who carefully took apart its steel frame. You could follow along with the progress as someone had spray-painted the floor numbers prominently on the outside of the structure. This one looked to date from perhaps the 50s and its departure apparently unmourned. It was the only remnant of a failed office tower project that was a victim of the recession of the early 90s. I watched this one come down bit by bit from the 10th story lunchroom in my building just to the south and west, and wish I had taken a few photos, as it made a beautiful, if transitory, ruin. Luckily lots of others did.